The practice of pushing or pressing sheet piles instead of vibrating them has become very common in applications where keeping ground and noise disturbance to a minimum is required. In fact, many projects near computer centers, historical buildings, hospitals, or schools require the use of a vibration-free method for installing sheet pile. 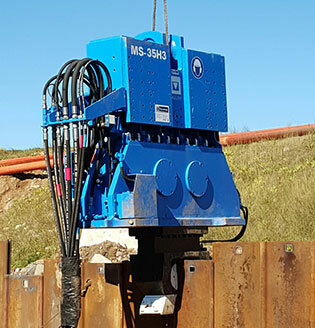 The ABI Mobilram multipurpose rig with "Z" Pile Pusher Attachment provides an excellent alternative to a vibratory pile driver. It is suitable for the static pressing and extracting of cold rolled interlock steel sheet piles as well as hot rolled U and Z steel sheet piles in different system widths. Depending upon the geological situation, high daily production rates can typically be achieved and the system is a genuine alternative to the Soldier Beam Wall with H-beams, particularly if a high ground-water level represents a problem. Accurate - Mast adjustment cylinders allow for the straight and accurate placement of sheets. Easy to Use - Remote control box and slewing of the mast up to 180° lets the cab operator see his work. Powerful - Each cylinder produces up to a load of 170,000 pounds of force and by reading the gauges, it is possible to determine the static load on the sheets. Environmentally Friendly - Quiet, vibration free, and does not disturb the soil. Productive - Pushes 4 Z-sheets at a time and requires only one pile buck and an operator. Safe - All sheet can be threaded at waist level.